At three o’clock in the afternoon, my energy levels tank. I used to solve the problem by brewing a second pot of coffee. But that made typing difficult, what with the jittering and everything. Eventually, my two pots of coffee a day habit lessened. Especially after an unforgettable and miserable New Year’s in Bilbao suffering from the ill effects of ten or so espressos consumed over only a couple of hours. Afternoon tea was invented by Anna, the seventh Duchess of Bedford (1783-1857), one of Queen Victoria’s ladies-in-waiting. In her day, the upper crust ate a huge breakfast, little lunch, and a very late dinner. Every afternoon, the duchess experienced a “sinking feeling,” much like the one I get. One afternoon she instructed her servants to serve tea and little cakes in her boudoir. The experience was so delightful that the Duchess made it a habit every afternoon from that day forward. Soon others followed the Duchess’ lead, and in just a few decades the custom of “taking tea” in the afternoon had become well established. At first the practice was limited to the upper classes, but it eventually became so popular that tea shops and tea-rooms sprang up left and right. This would hardly be news to the Arab world, where tea has been the beverage of choice for centuries, or to the Chinese who may have invented tea when it was noticed that a leaf that had accidentally fallen into some boiling water produced a fine aroma and a delightful pick-me-up. Set the table. Because it lends a sense of occasion to the proceedings and forces you to slow down and enjoy your cup. Bone china, polished silver, starched linens and something green and colourful as a centerpiece would not be remiss. Warm the pot. Yes, tea comes to the table in a pot. Warm it with hot water (which is poured out) or in a very low oven. A tea cosy will keep the pot warmer longer, if you can bring yourself to use one. One teaspoon of loose tea per cup (and “one for the pot”) is then added to the warmed pot. Fill the pot with freshly (almost) boiling water. Now, here is where things get tricky. Most stipulate that the tea should steep for two to five minutes. The longer it brews, the stronger the beverage. And, the more tannins are released. I like tannic wine. I’m not a huge fan of mouth-puckeringly tannic tea. I choose a strong tea and brew it for less time. Take a moment to enjoy your afternoon and have a cuppa. Or call for a whisky. It’s Friday, after all. This entry was posted in Entertaining, Living and tagged afternoon tea, Anna Duchess of Bedford. Bookmark the permalink. Lovely – let’s bring back the rituals of tea time. A few small points. If you are using green or ‘china’ tea it should be much weaker. One teaspoon is enough for a whole pot. And the water should not be boiling; let it cool for a minute or so before pouringon to the tea in the warmed pot. Loose tea can be put in a tea ball and removed when it has infused to your taste. Milk in the cups after the tea please – MIF used to be snobbish English shorthand for those who put milk in first and were considered ill-bred. China tea is best without milk; maybe a very thin slice of lemon – it should be thin enough to float.Crusts cut off the cucumber sandwiches of course. I used to love it when at a local caff, I’d be asked if I wanted my tea black, white or builders, which was a lot of cream and sugar. I agree with M.Lane–tea’s best when someone else makes it! However, when the boys were home on occasional Sunday afternoons I’d make a cake or madeleines which we’d enjoy with a pot of tea. Also, I have fond memories of vacationing in Bermuda and coming up from the beach around four for an elegant English tea. Parthenope, thanks for the corrections to form! Mr. Lane, what a treat. Mrs. E. and I hope to visit Montreal, Toronto and Quebec one day. We’ve only made it to Edmonton… a strange tale in itself. White nights. CL, much, thank you. Bermuda is always at the top of the wish list. My parents made it in the 60’s. I have yet to visit. Yes, yes, and yes, again. Afternoon tea is a perfect pick-me-up. Though so is a glass of Champagne at breakfast. AL, as usual you bring a smile to my face. What a sweet memory this recalls. I leave a little tray painted with a Parisian scene on my kitchen counter – draped with a colorful napkin, a small teapot, cup and saucer. I always smile when I look at it, as it reminds me of the ornate silver tray my grandmother always set up the night before – the slender, polished silver teapot, tiny porcelain creamer and sugar bowl, and starched, white napkin – ready to greet her when she awakened. I love Earl Grey – and most all black and green teas. However, I stopped taking lemon after I read that lemon softens tooth enamel, which then becomes more susceptible to stain. Here I am…the life of the party…still, I thought you should know…. DD, what a fine tradition. I read that Van Day Truex used to set a tray the night before, too. I think that your grandmother’s habit deserves a post of its own… thanks! My favorite tea memory is of the year I worked in a London hospital as a medical resident (early 1980s). At 4:00 PM, patient care stopped and the physicians (all male) gathered in the lounge. The head nurse (“Sister”) then rolled in a tea trolley and served the physicians in order of seniority. I’m sure things have changed since then. Thank you for the accurate definition of “high tea.” So many people who should know better use this phrase incorrectly. Do you know the excellent “Taste: The Story of Britain through its Cooking” by Kate Colquhoun? It casts doubt on the Duchess’ claim to have instigated the fashion, but recounts delightful anecdotes such as Dr. Johnson’s claiming he was so addicted to tea that his kettle rarely had time to cool, and Queen Victoria’s avowed preference for bone marrow on toast rather than dainty sandwiches and fussy cakes in the afternoon! Just one other point – there is the option of no additives to tea – indeed the really great teas, such as vintage Darjeeling, are spoiled by milk or lemon and as for sugar – ugh. Mr. Stuart, yours is the stuff of between the wars fiction! What an interesting experience you must have had. Cornflower, welcome and no, I hadn’t heard of the book until now. Those are just the sorts of anecdotes that I love to read. Where I come from (Edinburgh, Scotland) putting milk in after was considered a social faux pas. My wife, brought up in England concurs. The story I was told is that the addition of milk to priceless antique china before the close-to-boiling tea hit prevented irreparable cracking. Great post! I love drinking tea any time of day. Such a shame that most of us don’t have the kind of lifestyle where we can stop every afternoon for a proper tea (really, wouldn’t cucumber sandwiches and scones be a divine way to recharge every day?). And thank you for pointing out the proper definition of high tea. It’s amazing how often that term is misused. 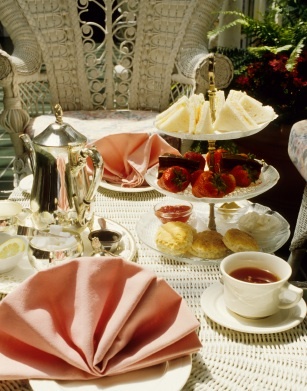 I always cringe when I see hotels promoting their high tea at 4:00…I suppose they think they are being so genteel. The memory is made more remarkable by the fact that the senior physician standing to my side (and maintaining a stony silence) was the first human to run a less than four minute mile. Shepherd’s pie, with mystery mince meat topped with mashed potatoes, with a side of . . . boiled potatoes. And wasn’t it reported a few years ago that HM Queen Elizabeth is defiinitely MIF? Great reading, both the main entry and the comments. Some thoughts about green tea. First, there are several varieties. Japanese green teas have a very different flavor from Chinese and Taiwanese varieties, both of which are similar to each other. Milk, sugar, and lemon are absolutely out. The water should be boiled then allowed to cool; most varieties of green tea are best brewed at around 175° F (the appropriate temperature is usually printed on the package of Japanese tea–in Celsius, of course). Brewing time should be short; I find 40 seconds works well. So, if you don’t like green tea, it’s probably because you’ve never had it brewed properly. Love this! When I serve tea, I try not to label it too much… Tea Time is sufficient. I love to know all the ins and outs. I think less about royalty at tea, and more like Cary Grant at tea — maybe it’s an Americanizing of the ritual — elegant, but not as fussy? Love afternoon tea, and that spread is gorgeous! EQV, yes, doing away with fussiness is a distinctly American trait. One that I applaud. Brent, excellent! Thank you for the information. Mr. Stuart, you have lived a Wodehouse novel. al, interesting… that’s what I thought. Thank you very much for sharing the background information about afternoon tea. I love High Tea, especially if it is served in a bone china cups and saucer. Recently, I visited Bath (England) and I was delighted to find that there is still some remaining quaint little tearooms that serves homemade scones and cake with variety of tea. ALthough the owner said that they were competing against Starbuck and Costa and so on. I would be awfully sad if the tea rooms would all disappear in the recession. Here is a link to my favourite tea room in Bath (http://visitbath.co.uk/site/eating-and-drinking/the-pump-room-restaurant-p30351). When I was there, there was a little performance of the String Quartet while charming waiters and waitresses going around with their little trolley with full of cakes and pudding to choose from. I felt like I was in one of my favourite English films, Keep the Aspidistra Flying. PS. If you can’t travel to Bath, there is one place in London I just adore called “The Wolseley” (http://www.thewolseley.com/). My father used to take me as a treat when I was young. I’d highly recommend it. But you’d need to book it in far advance to secure a table there. Hello G-M Jones! Made it to Bath once and was freezing cold. Didn’t stop in for tea, more’s the pity. Thanks for the link. Next time…. (b) hog’s pudding slices – but transport might be a problem.